Ah, the nostalgia. Do you remember the days when Sonic the Hedgehog was the only game that anyone was playing? Well there seems to have been a bit of a revival for our blue spiky friend. There are new console games being released and there is even a PS2 and XBox compendium that features all of the classic Megadrive and Sega Game Gear games. 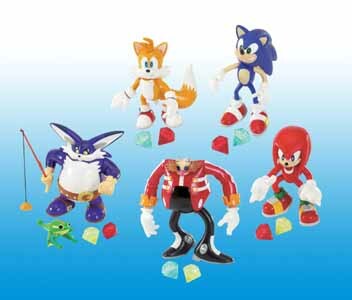 Now F.E.V.A has launched a range of cool collectible figures of various sizes (some featuring sound), beanies, plush, inflatables and cutting edge games. 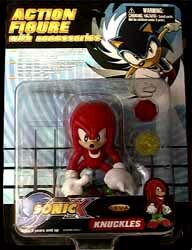 Knuckles, like the other figures in this series, comes equipped with two chaos emeralds. He has spiky gloves and his shoes look as though they have two Lego bricks stuck to them. He is manufactured from good quality materials and looks authentic when compared to his cartoon (and computer games) version. Young fans will love these toys as they will be able to recreate scenes from the cartoon series, and adult collectors will be impressed with the attention to detail - especially at the price. I still can't believe how cheap this range is - £6 is nothing at all to pay for something that will give you hours of fun. These figures are sure to fly off the shelves so make sure you make a dash to your nearest toy store.